A couple of months ago, the awesome peeps at Foodbuzz got together with the ever-so-wonderful folks at Eggland's Best Eggs got together to offer us Tastemakers a chance to get creative with our free dozen of eggs for a chance to win a year's supply of EB's eggs. Naturally, I made sure to make the most of this and ended up submitting three of my egg recipes: The "Spanglish" Sandwich, The Ultimate Veggie Omelette, and my Baked Eggs with Tomatoes & Peppers. I'm not sure which one got their attention (though the baked eggs did end up being one of EgglandsBest.com's featured recipes) but whichever one it was, I was stoked to know it made me one of the 10 winners of this awesome prize! After a long, long wait, I finally received my prize last week (in the form of coupons not a giant crate of eggs, in case you're wondering). I was all flustered at first because the idea of being able to make all sorts of egg recipes without having to worry about how to afford the next dozen was just too good to be true! I settled on a new baked egg variation and did what I always do to get some inspiration: I poked around my kitchen to see what else I could throw into my little ramekins. Ham - check! Asparagus spears - check! I was about to get cookin' when I saw those two perfect tomatoes I still hadn't sunk my teeth into. They were so perfectly shaped and round and large, that it seemed almost criminal not to use them as my "ramekins" this time. And so my tomato cups were born. This combo is simple yet so very tasty, and the recipe is ridiculously easy to prepare. I used plain ol' deli ham and some thawed asparagus spears from Trader Joe's because the good fresh ones have gotten expensive again (meh). The only thing that will take some caution and care is removing the flesh & seeds from the inside of the tomato without ruining the outer part. The best way to do this is to cut just a very small part off the tomato top (resist cutting it in half as you'll lose most of your cup's shape this way) and scoop out the insides gently. Other than that and a little bit of chopping, this practically cooks itself! It's another great way to enjoy eggs, and even with the way the skin "tears" with the heat of the oven (don't worry, this is normal!) it's makes for a lovely & unique presentation, so it would be great to serve to guests for Sunday brunch. Served with some warm crusty bread to sop up the yolk & you have a fabulous little meal for very little moolah! Preheat oven to 425°. Lightly coat the bottom of a small baking dish with cooking spray and set aside. Cut off the top of the tomato and gently scoop out the flesh and seeds (don't toss it! You can use this to make a light salsa later). Sprinkle the inside of the tomato cup with a small pinch of salt and add the diced ham and asparagus. Crack the egg into the tomato and carefully place the filled tomato into the prepared baking dish. Bake for 20 minutes or so (longer if you like a harder yolk). Remove from heat and carefully transfer to a serving plate with a wide spatula or slotted cooking spoon. Serve with extra asparagus spears and a nice chunk of warm crusty bread, and enjoy! Congrats on the contest--this does look great! Wow Kim this looks incredible and delicious! I will have to try this soon! I had a tomato on hand and couldn't wait to try this, but didn't have ham and asparagus. I lined the inside of the hollowed-out tomato with spinach and added some green onions, sprinkled parmesan on top when cooking was almost done, and it was sooo delicious! What a great idea. I like everything that's in this. Congrats on your win! Congratulations on your win Kim! Katie, dig your idea! I've been staring at a few tomatoes in my fridge and now I know what to do with them! 'Cause staring just isn't the best thing to do with tomatoes. What a simple, creative, and delicious twist on eggs! I think the right person won. And this creation is just one delicious use for eggs, looks great. Love your approach to eating on a budget. We can all use that information in these lean times. 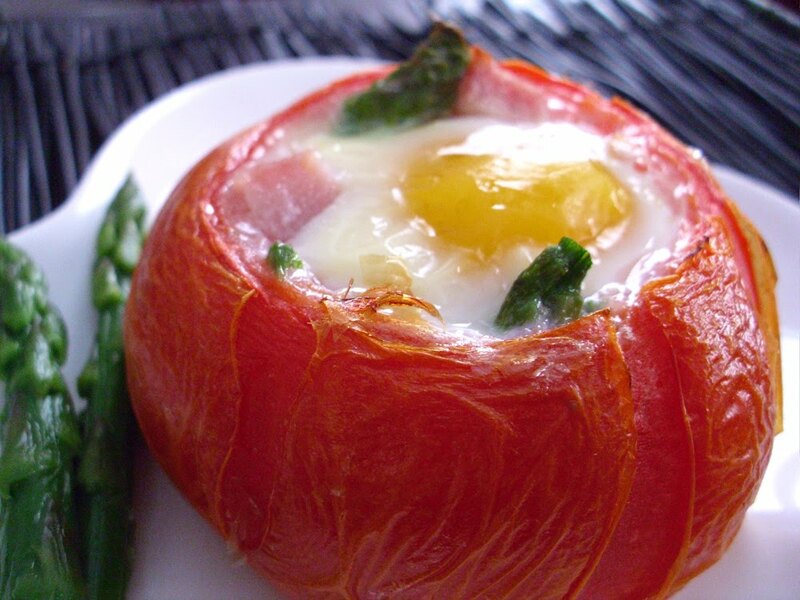 I will be trying the baked eggs in tomato eggs! Perfect breakfast on tomato bun. I will have to try this one. She sure does eat well! This is both creative, beautiful and looks delicious. She's not only poor, but brilliant! Mm! I think that looks like an excellent idea for what you can do of tomatoes that are going too ripe. Thanks for your inspiration! We took this and modified it this afternoon... loved by all! I love any recipe that involves baking an egg inside something edible. And given that it's tomato season, this looks just perfect! I could really use some advice on how to "gently scoop out" the insides of the tomato! I tried this tonight, and I got so frustrated with the tomato and how careful I had to be so as not to puncture the exterior! I ended up leaving about a 1/4 of the tomato in the bottom, and of course it was super runny when I cut into it. So tips would be great!